Posted October 1, 2018 by Jenna & filed under KidLit Coffee Talk. Happy October! Grab a cup of coffee and join me for KidLit Coffee Talk. 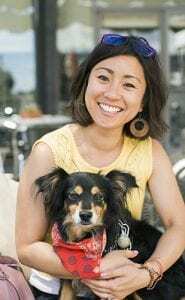 Today, I’m thrilled to be joined by author/illustrator Sarah Momo Romero. 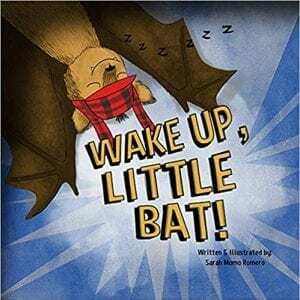 Sarah and I are Clear Fork Publishing sisters, and her debut picture book, Wake Up, Little Bat! (Clear Fork Publishing) enters the world today! It’s an endearing story about a little bat who just can’t stay awake at night. Sarah was kind enough to answer some questions about her publication process and life as an author/illustrator. I love to drink all kinds of tea, black and green, but I think Earl Grey is my favorite. Too much caffeine makes me jittery, but I love to have a nice hot cup of coffee and almond milk with breakfast (preferably pancakes!) on the weekends. Nothing is better than coffee and pancakes. Tell me a little bit about yourself and your writing journey. I am a Japanese Peruvian American artist and writer living in Los Angeles. I’ve always loved to paint and draw, but kept my writing more to myself in journals. I work as a graphic designer, and it wasn’t until a story I’ve had bouncing around in my head for years finally pushed me to take a writing class, and I discovered how much I love to write picture books. Tell me about Wake Up, Little Bat! The story for Wake Up, Little Bat! started off as a little owl with a red plaid hat who couldn’t stay up at night when he was supposed to. Many, many sketches and failed attempts at a story later, the little owl transformed into the Little Bat with the same red plaid hat and my debut picture book! I learned so much through writing the drafts of this picture book, but illustrating it really pushed me to my limits. I love that Little Bat wears a plaid hat. What was the most exciting part of the publication process? What was the hardest? There have been so many exciting milestones along this journey, but the top two so far are receiving the contract from Callie at Clear Fork Publishing, and receiving my first copy of Wake Up, Little Bat! in the mail. This whole experience has been a bit surreal, and both of these moments made me feel like this was all really happening. The hardest part of the publication process was the day-to-day grind of illustrating the picture book. Don’t get me wrong, I’m incredibly grateful Callie believed in my artwork and gave me the opportunity of writing and illustrating my story. But I also work a full-time job, so all the illustrating for Little Bat happened after work, late into the night, on the weekends, and sometimes even on the train ride to work. It was a tough few months of really hard work, but all of that definitely feels worth the incredible feeling of having my first published picture book in my hands. I can’t wait to share it with everyone! All your hard work paid off because the illustrations are adorable! What else are you working on? I hope to continue publishing picture books for kids, so I’m always working on new manuscripts. I am especially interested in stories that will introduce readers to more diverse characters and little known cultural traditions. Hopefully, more of those stories will get out into the world! When I’m not writing, I’m trying to improve on my illustration style, and I’m focusing on drawing kids and people (something I’ve never felt too comfortable with.) And one day, I hope to work on the middle grade novel idea I’ve kept in my back pocket for the past year. No matter what, I want to continue on this creative journey, whether it’s writing or illustrating for children’s books, or both! The world is certainly in need of more diverse characters in picture books. How has life changed for you since becoming a published author? I think the biggest change in my life hasn’t been since becoming a published author, but it has been since I first dedicated my creative energy towards want to becoming a children’s book writer. Before this, my creative side felt stifled, but I didn’t really know what to do to feed the craving for creating art. I felt lost and didn’t know what to do about it. But now that I’ve discovered this new passion, I’ve been to incredibly inspiring conferences, I’ve met so many writers to share ideas and experiences with, and have connected on a creative level with my husband. He’s a natural storyteller, and it’s been really fun to bounce ideas off of him and get his feedback on what I’m currently working on. He can be brutally honest, but he has helped toughen me up and push myself to get better at my craft. Ha ha, my husband is my toughest critic, too. What’s one picture book you loved when you were little and a more recent one you love now? My favorite book from childhood is If You Give a Mouse a Cookie written by Laura Numeroff and illustrated by Felicia Bond. I had a favorite little plush mouse as a little girl, and I wouldn’t go anywhere without it. This book had me imagining what it would be like if my little mouse was a real-life friend. I still have my original tattered copy on my bookshelf. I have so many favorite picture books now, but at the top of my list is Journey by Aaron Becker, and the other books in this trilogy. It was the first wordless picture book I discovered on my writing journey, and it felt so magical to get lost in a story of beautiful illustrations without a single word on the page. I haven’t read that one yet, but now I can’t wait to check it out of the library. What are you currently reading? The Last Equation of Isaac Severy by Nova Jacobs. I’ve been pretty busy these past few weeks, so it’s getting a little dusty on my nightstand, but I love that it’s a mystery that takes place in the city I live in and love, Los Angeles. I will also be reading The Dry by Jane Harper with my ladies book club for October. I love reading, and I always have a few books and audiobooks on rotation. Sounds great. What is one thing most people don’t know about you? I love Halloween and have always been drawn to the mysterious, paranormal and sometimes dark aspects of life. Think more Tim Burton and Guillermo del Toro, less gory and unnecessary violence and blood. I get a thrill out of going to creepy Halloween events and watching suspenseful horror movies, even though they can give me nightmares. There’s something about the darkness and unknown that is really fascinating to me. Maybe one day it will translate into a slightly creepy but mostly fun picture book! Thank you so much, Sarah, for chatting with me, and congratulations on the publication of your debut picture book! Connect with Sarah on social media! Sarah has generously offered to giveaway a copy of Wake Up, Little Bat! for one lucky KidLit Coffee Talk reader! To be eligible, all you have to do is a leave a comment on this post. I will choose a winner at random next Friday, October 12th. Good luck, and thanks for stopping by! Thanks for sharing about this book and thank you to Sarah for sharing her process. It’s interesting to see how things transform from the beginning. Thank you for reading, Laura! Little Bat really went through a transformation through the process. Can’t wait to read this one! And I love connecting with fellow CFP authors and illustrators. Congrats, Jenna on a great interview, and congrats, Sarah on your book. Thank you Ellen! It’s so great to be Spork sisters and be part of such a supportive community. So happy for my friend, Sarah! Congratulations and I’m excited for my copy to arrive in the mail. Great interview, Jenna! Happy to read the dialogue between my Clear Fork Sisters! I loved hearing how your story and illustrations evolved. Thanks for sharing! Sarah, this is a lovely interview! I’ll grab a cup of Earl Grey to enjoy when I finally get to read Little, Bat! Thanks for sharing your process Sarah and congrats for your debut picture book. I will be adding it to my bookshelf. Congratulations, Sarah! Loved learning more about you and Little Bat! So happy to see your book out in the world! Great interview Jenna! Sarah’s book looks adorable and this is so exciting for this, her debut book with fabulous, Mira from CBA and Callie at Clear Fork Publishing! Chills of excitement! Thanks so much for sharing your process and insights! Your book sounds adorable! Congrats! I am so very, very happy for you! ¡Viva el Perú! Felicitaciones from this Peruvian/American kidlit writer. So proud you with your new book. Keep up the great work! Congratulations, Sarah! I know it must be a very exciting time for you. Your picture book sounds wonderful and Little Bat is so cute. I also had a stuffed mouse when I was young and slept with it up into my teen years! His name was Mousey. Congratulations, Laura Roettiger! You are the winner of Wake Up, Little Bat! And thanks to everyone for joining me for KidLit Coffee Talk!